…then you probably have a science fiction or fantasy manuscript, so you should participate! And since you have a few days, here are some ways to get ready. 1. Start working on your pitches now. If you haven’t done a Twitter pitching party before, you may not have an appreciation for how difficult it can be to encapsulate your entire novel in a 140-character tweet. Sure, anyone can probably do it. But doing it well is another matter. Your pitch needs character, goal, obstacle(s), and stakes. It has to be both coherent and engaging. This is not something to throw together at the last minute. You’ll note I said pitches, not pitch. Because the event runs all day (from 8 a.m. to 8 p.m. Eastern Time), you should plan on 10-15 Tweets. They can’t be identical, because that’s a violation of Twitter’s terms of service. More importantly, you should use this opportunity to experiment with a few different pitches. Don’t just move the hashtags around, either. Experiment, try different angles, and have fun with it. 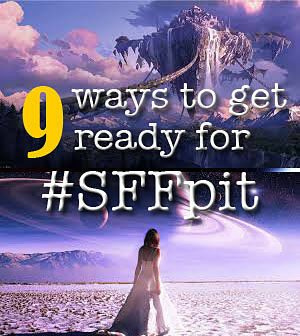 Head on over to the #SFFpit contest page for instructions on how to pitch, when to pitch, and a good list of DOs and DON’Ts. There aren’t very many rules. Your work needs to qualify as SF/F. You shouldn’t pitch more than 1-2 times per hour. And you should use the hashtag! It’s #SFFpit, not #SFpit or #SFFpitch. For more advice and guidance on Twitter pitching, listen to my guest appearance on Dan Bensen’s Kingdoms of Evil writing podcast. Can I bring the hammer down on you if you’re doing something wrong? Not really. But remember, agents and editors — the same people you’ll have to win over if you want to have your book published — will be watching the hashtag. 3. Have your query letter and submission ready. If you’re successful during #SFFpit, you’ll get one or more “favorites” from literary agents or editors. These should be considered an invitation to submit. The submission guidelines may vary — scroll up in that person’s Twitter feed to find out — but the requesting agent/editor almost certainly going to want a query letter and the first few chapters. Some may also want a short (1-2 pages) or standard (4-5 pages) synopsis. These should be ready to go, proofed, peer-reviewed, and polished. You don’t need to submit them the second your tweet is favorited (it’s probably better to wait), but I highly recommend responding within a few days. At most, a week or two. That’s when the other participants will be submitting their materials, and you don’t want to be the latecomer. Also, the agent or editor is more likely to remember your pitch, which is going to help you get to the top of the pile. Twitter pitching is tough. No one expects you to nail it on your first try; that’s why virtually all successful authors have critique partners and writing groups. A pitch that’s perfectly clear to you, the author of the manuscript, may be confusing to someone else. Ask a friend to look at your pitches and offer their frank advice. It doesn’t need to be a writer (although that helps); it just needs to be someone who’s willing to give you honest feedback. So, not your mom. You must have a Twitter account to participate in #SFFpit and other events. If you don’t have one, now is a good time to sign up. It’ll also give you a chance to follow people who interest you — authors, agents, editors, writing organizations, etc. — and perhaps get some followers in return. Here’s why: people who like your pitch will click on you and look at your profile. They may even want to follow you. This is far more likely if you have a profile image that’s not an egg, a header image of any kind, and at least 10 followers. You’re welcome to watch the contest throughout the day and make your pitches manually, as you see fit. However, you might find it far easier to use one of the free social media management tools (like Hootsuite or Tweetdeck) to schedule your tweets in advance. This frees you up to watch the hashtag, or do your job at work, run errands, etc. It’s worth signing up for one of these and making sure you know how to use them. If you’re going to be part of this pitching contest, you might as well bring a friend along. Surely you know someone who’s written a fantasy or sci-fi manuscript and needs representation. Or maybe you know an agent or editor who might be interest in reading the pitches. Please, spread the word about our event so that we get a good turnout. On December 9th, your Twitter followers — as much as they may love you — might feel a bit overwhelmed by the hourly pitches for your book. Make sure to apologize in advance, explain what you’re doing, and thank them for their patience. They will appreciate this small gesture, and will be less likely to unfollow you because of it. The wonderful (or frightening) thing about Twitter is that it’s an open platform, meaning that you pretty much have unfettered access. It means you can check your dream agent’s Twitter feed for the last 10 years for hints of what he or she may be looking for. You could also go back and read my summary of Brenda Drake’s January #PitMad, or more recently my breakdown of New Leaf Literary’s #NLpitchperfect, to see what the trends were. #SFFpit is Tuesday, December 9th. If you’d like to get some practice in, think about participating in PitMad, the Twitter pitching event held by Brenda Drake, which will be on December 4th. There’s no reason you can’t do both, though SF/F authors tend to do better in #SFFpit because it’s more genre-focused. We’ll probably also do a practice-pitch event earlier that week. You won’t have to pitch your own work; you’re going to be pitching fantasy/sci-fi that you know well because it’s already published. Details will be coming soon, so stay tuned! Great advice, Dan! Number 3 is SUPER important! Some of the agents and editors who ‘favorited’ my pitches in pitmad wanted a synopsis and they all named a different length: two-page, three-page, full synopsis. Have it all ready!